Set ten years after the events in The Phantom Menace, the galaxy is on the brink of civil war. Led by a former Jedi named Count Dooku, thousands of planetary systems threaten to secede from the Galactic Republic. After Senator Padmé Amidala evades assassination, Jedi apprentice Anakin Skywalker becomes her protector, while his mentor Obi-Wan Kenobi investigates the attempt on Padmé’s life. Soon Anakin, Padmé and Obi-Wan witness the onset of a new threat to the galaxy, the Clone Wars. 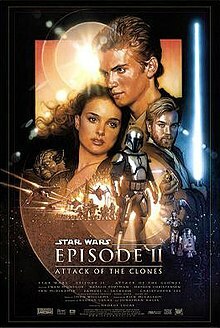 Development of Attack of the Clones began in March 2000, after the release of The Phantom Menace. By June 2000, Lucas and Hales completed a draft of the script and principal photography took place from June to September 2000. The film crew primarily shot at Fox Studios Australia in Sydney, Australia, with additional footage filmed in Tunisia, Spain and Italy. It was one of the first motion pictures shot completely on a high-definition digital 24-frame system. The film was released in the United States on May 16, 2002. It received mixed reviews, with some critics hailing it as an improvement over its predecessor The Phantom Menace and others considering it the worst installment of the franchise. Although the visual effects, costume design, musical score, action sequences and McGregor’s performance as Obi-Wan Kenobi were all praised, the romance of Padmé and Anakin, the dialogue, the screenplay and the film’s long runtime were all criticized. The film was a financial success, making over $649 million worldwide; however, it also became the first Star Wars film to be outgrossed in its year of release, placing third domestically and fourth highest-grossing worldwide. The film was released on VHS and DVD on November 12, 2002 and was later released on Blu-ray on September 16, 2011. The third and final film of the prequel trilogy, Revenge of the Sith, was released in 2005.